Welcome to the Church of God of Prophecy in the State of Washington! 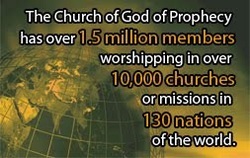 The Church of God of Prophecy (COGOP) is a Christian, Bible-believing, Spirit-filled fellowship that has been in existence since the late 1800's. You will find our International Offices located in Cleveland, TN, but our vibrant churches extend all over the world. Please visit our International Office site. 7319 199th St. Ct. E.
Enter your email below to stay informed by receiving the Lamplighter, the monthly email newsletter for WA State COGOP.